With only a day remaining before the United Kingdom referendum on whether to remain with the European Union or to leave, a myriad of commentators have aired their opinions on either supporting or opposing Britex, that is, “Britain Exit”. But of the most surprising two cents to come out so close to the June 23 referendum date was that of British-born American novelist and comic book writer Chris Claremont, and he is using as a mouthpiece one of his literary creations: the UK’s first original Marvel Superhero, Captain Britain. Captain Britain’s character first appeared in print in 1976 as the first original character to be published in Marvel Comics’ former Marvel UK imprint (now part of Italy’s Panini Comics as Marvel’s general reprint distributor for Europe). Created by writer Chris Claremont and artist Herb Trimpe under the directive of Stan Lee, he was initially conceptualized as a British counterpart to Captain America, though he eventually developed his own unique mythos under the direction of Claremont and briefly, Alan Moore. His true identity is Brian Braddock, son of an aristocratic family and a physicist with a PhD. Gravely wounded during an armed assault at the nuclear research center he was working at, Braddock was aided by an extra-dimensional being calling himself Merlyn, who gave him magical powers of superhuman strength, speed and durability, and tasked him to uphold the laws of Britain. As Captain Britain, he fought alongside Captain America against neo-Nazis led by the Red Skull, journeyed through numerous parallel universes as one of the pan-dimensional Captain Britain Corps, and led superhero teams such as Excalibur and MI: 13. He is also the twin brother of Betsy Braddock, the mutant X-Man called Psylocke, though why she looks Japanese right now is another long story. Chris Claremont was born in London in 1950, with his family moving to the United States when he was three years old. He was hired by Marvel Comics during his college undergraduate years as an editorial assistant, eventually landing a writing assignment in 1975 for the “X-Men” comic line which he turned into a story and sales juggernaut. 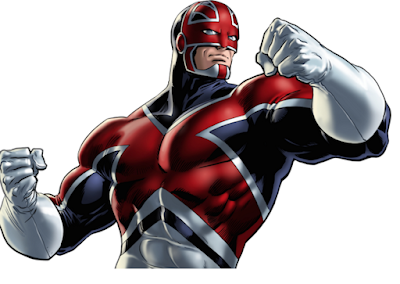 His opinion on the Britex issue came up amid yet unconfirmed rumors that a TV series starring Captain Britain was under development.